Bundle includes Darice Floral Design Wreath Hanger Metal Standing Black Adjustable 38in. (4 Pack) 6557 86 and 1 Artsiga Crafts Small Bag. Price includes 4 pack(s) per order, with 1 piece(s) per pack. 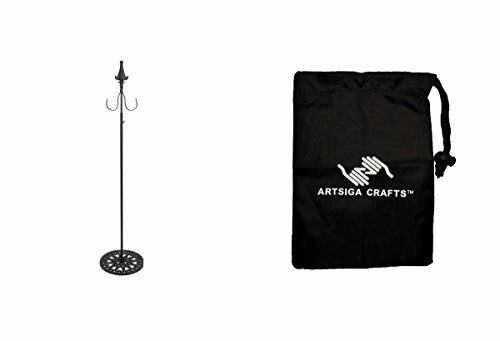 Artsiga Crafts bag measures approximanetly 6 x 8in., made of heavy nylon material and includes a drawstring closure; this bag is deal to store small craft items or cell phones and accessories. If you have any questions about this product by Artsiga Crafts Darice Floral Design Wreaths, contact us by completing and submitting the form below. If you are looking for a specif part number, please include it with your message. Club Pack of 12 Decorative Red and White Snowflake Christmas Wreath Door Hangers 18"